No, she's not praying. Three guesses how dinner is going at our house right now. You can grill your own Teriyaki chicken (try whipping up a batch of this Teriyaki Sauce–you can use it in this recipe, too!) or buy some pre-grilled chicken at the store. Usually I’m 100% for using rotisserie chicken in chicken salad, but this recipe tastes so much better when you used grilled chicken. Toss it together with some diced celery and green onions, a little mixture of mayonnaise and Teriyaki sauce (you need something a little thicker like Kikkoman Teriyaki Baste and Glaze or our homemade sauce), cubed mango (click here for an awesome tutorial on how to manage that pesky fruit! )!, diced pineapple (fresh is awesome, but canned works well, too), and sliced almonds or shelled sunflower seeds. Then just serve it on sliced croissants with a leaf of lettuce! 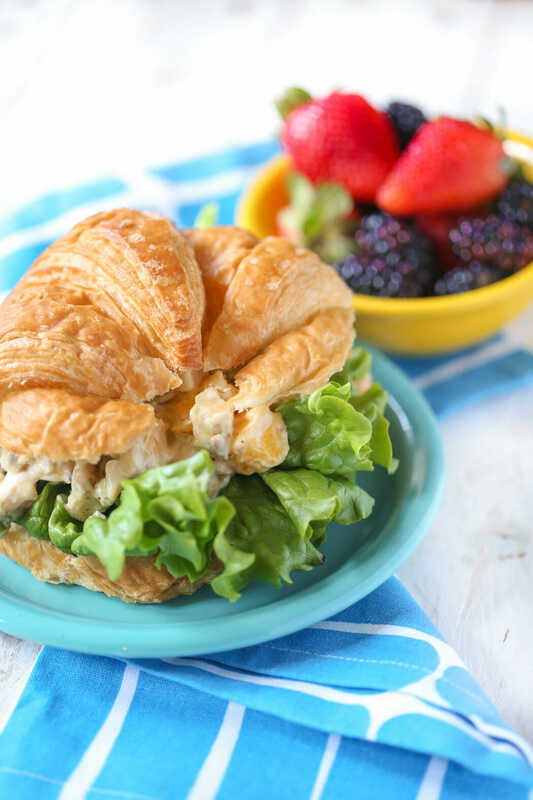 This cool and refreshing twist on chicken salad sandwiches is perfect for showers, luncheons, and hot summer nights! Marinate chicken for at least 4 hours. Grill for about 7 minutes per side. While chicken is grilling, combine celery and green onions in a small mixing bowl or a plastic storage container with a lid. When chicken is done, allow to stand for about 10 minutes and then cut into bite-sized pieces. Toss with celery and onions and then add mayonnaise and mix thoroughly. Start with 1/3 cup and go from there. Add 2-3 (or more) tablespoons of Teriyaki sauce to taste. The thickness of the Kikkoman Baste and Glaze (or the homemade recipe) is important because it helps keep the dressing from becoming too runny. You want to add some of the yummy Teriyaki flavor, but you also don’t want it to be overwhelming. Refrigerate for several hours. That looks sooooo good. Can’t wait to try it! I’ve been drooling over the recipes this week until my husband reminded me I don’t actually like mango. But I think I do now. YUM! I’ll be trying this for sure. Wish you were close enough to join me. Sniff sniff. I love this salad! I especially love it with Mango. Mmm, this has been a favorite of mine ever since that time you made it for everyone in Provo. I had never had chicken salad with terriyaki and at the time I don’t think I even noticed that’s what was in it, but I LOVE this salad! I’ll have to try it with mango. oh wow. . . that looks divine. Oh wow, that sounds SO good! I’ll have to make that this week. Yum! I made this for Sunday lunch today. My family LICKED the bowl clean!!!! – My favorite chicken salad recipe TO DATE!!! Thanks Kate. We had this for dinner last night…SO good. We put it in pitas, which was good. Today for lunch, I had leftovers and just put it in lettuce to save a few calories. I think that I actually liked it better in the lettuce because it didn’t have any additional flavors to distract from the salad. This will go on my favorites list!! Thanks for the fab recipe! K…sorry…I know that I already left a comment about these, but seriously folks…these are amazing. I accidently thawed out chicken thighs instead of breasts, and let me tell you…ridiculous! This is seriously a brilliant recipe! Thanks! I hate mayo, so therefore I hate chicken salad. However, I LOVE this. And so does my family. In fact, we are serving it Saturday at Evan's 1st birthday party!!! Just curious…have you ever used costco canned chicken in this recipe or shredded chicken breats? If so, is it just as good? I made this all the time before I switched to a plant-based diet. It is delicious! How perfect for summer! Looks great! My mouth is watering! I cannot wait to make this! I have never left a comment here before but I think it is high time that I did since I stalk your blog pretty much daily. I have loved every recipe that I have tried from the two of you and was just wondering if you ever planned on heading south ever as in Arizona??? Me and one of my friends always talk about “if” you ever came down here… Anyways we love what you do and would love to meet you someday. I’m glad you are entering the world of comment-leaving! In terms of book signings, we go where they send us! We do have lots of fans in Arizona though- so maybe we’ll head down there! I found this one in the cookbook a couple of weeks ago and tried it out. It was a nice change from the traditional chicken salad. THANK YOU! I was just looking for a recipe to make for our family Mother’s Day gathering. Yay! I hope your husband is doing alright and wishing him a quick recovery! My MIL had her gall bladder removed a few months ago, and she went on a 3 week vacation to Peru and the Galapagos a week later. So hopefully his recovery goes as well! I can’t wait to try this recipe! I’m going to make it for my girlfriends in my monthly crafty get-together. Sounds perfect for that. Yummy!! I wish my hubby enjoyed fruit with meat, and mayo for that matter. For my next Bunco night, I am for sure going to try these! This looks really good…my husband generally does not like stuff like tuna salad, chicken salad etc. due to the mayo. I think I’ll try this sometime, though, and see how it goes over. Also, I hope your husband’s surgery went well. I had my gall bladder removed a few years ago. Recovery was not fun but I am soooooo much happier now that it is gone. It was causing a number of issues that I didn’t even realize were related, like a really bad back ache! Anyway, wishing him a speedy recovery. This looks really good. I make teriyaki chicken all the time and this is a great lunch for my leftovers. Great summer recipe for when it is too hot to cook to. BTW…awesome Cinco de Mayo recipes yesterday! Next year I am going to have a party and incorporate some of your recipes. DELISH! You are amazing for doing a post on such a crazy day.We love you and hope you hubby is feeling better soon! Oh dear. 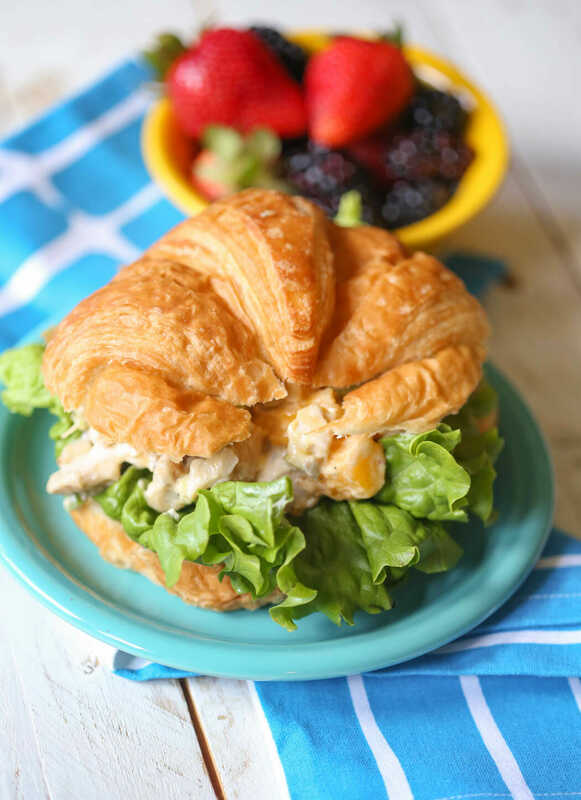 I have recently become obsessed with chicken salad and this one looks awesome! I would probably use the oranges though. I don’t have a grill (I know *gasp! *) thanks to the fact that our city will only allow small propane tanks on apartment balconies and we couldn’t find one so out the grill had to go. But I promise I will find a way to get some grilled teriyaki chicken. Seriously I’m drooling here. On and P.S. I hope your husband is ok! I had my gallbladder taken out New Years Eve! Please give your husband my best wishes! Is there something else I could use in place of mayo? Thank you! Ann, I have used non-fat plain yogurt in many things replacing mayo. It is a bit wetter but does a good job for those who are cutting calories or don’t like mayo. Good luck! Greek yogurt doesn’t have the ‘wet’ factor and is soooo thick and creamy and very healthy when you get the nonfat kind. I use it to substitute mayo as well and I like it better than regular ‘American’ plain yogurt. Try it if you haven’t before! That looks so yummy . . . I wish I had one right now. I am so hungry! I hope everything is ok with your husband! Worried about you guys since you didn’t come back and post again. Funny how I feel like I know you ladies. LOL! My husband who says he doesn’t like Teriyaki sauce, loved these and my kids (4 and 7) ate them right up too. 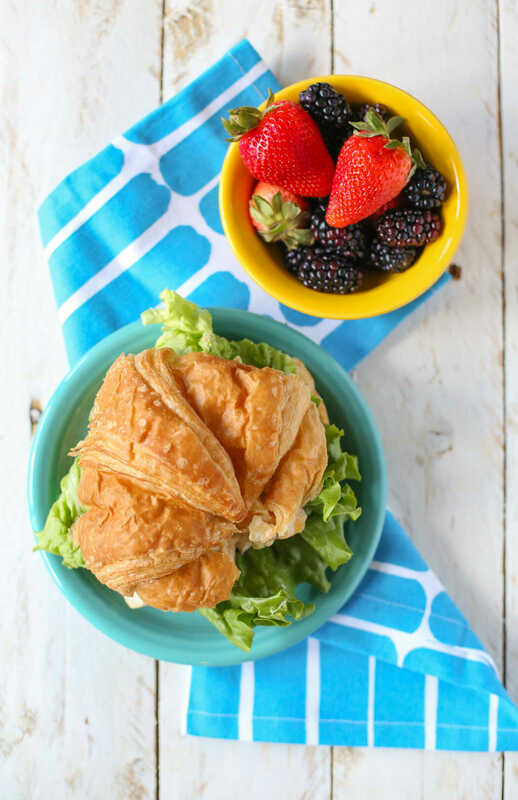 Loved this recipe and also tried the strawberry limeade! Wonderful!! I made this, it was soooo good!! It was a nice change from classic chicken salad, thanks! I made this on Saturday! It was so yummy! My picky eater even ate it…quickly too! Indidnt have time to marinate, I just used a rotisserie chicken and it was so good! Apparently I need lessons on how to cut up a mango though! Could you substitute the Mayo for Olive Oil or something like that? My husband has a phobia of Mayo and refuses to eat it. Silly husband! Unfortunately no, I don’t think it would taste great with olive oil. Marcia–I would say 4-6 larger servings and 6-8 smaller servings. I really like the sound of a chicken teriyaki salad! Do you have a good “plain” chicken salad recipe? I have a few I like, I’ll have to post them! Delicious and delightful! Loved them with the mango and homemade teriyaki sauce. And they were tasty even without time to refrigerate thoroughly – I popped it in the freezer while chopping the fruit and stirred frequently so it would cool evenly. Thanks for the treat! My chicken is marinading now. The anticipation is killing me. That baste and glaze stuff smells divine! It was to die for! The hubby loved it and the kids (4y and 18 mo.) wouldn’t touch it, but I wasn’t expecting them to. More for us! I can’t wait for my leftovers for lunch today. 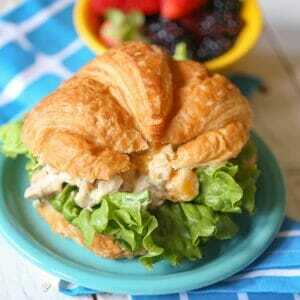 I’m looking for a chicken salad recipe to go on my pretzel rolls for a baby shower. Do you think this would taste okay served that way? Saw this in your cookbook this week and just made it last night. Huge hit!! I had people asking for the recipe; I told them they needed to buy your book :). Thanks! Hi…is there a button to print this? I can’t find one. Okay, I’m embarrassed I have to ask, but… what do you marinate the chicken in?! If it’s the Kikkoman sauce, how much? No need to be embarrassed! 🙂 Just marinate it in the homemade Teriyaki sauce or the Kikkoman sauce, just enough to cover the chicken. I want to make this for a teachers back to school luncheon… wonder how much chicken I would need for 50 people…. Hi, Laura! I’d plan on this recipe serving 6-8, so you’d just need to scale it accordingly. Any suggestions on how to round out the meal for a RS Dinner?? A tossed green or spinach salad or a fruit tray would be tasty! Never mind- I found the answer above! thanks a ton! I recently found out you can buy diced mango in a can, del Monte makes it, and I found it at Walmart. You can have mango all year round!